As sad as it was to leave Sierra Leone and move on, it’s equally as sad to leave the content behind as well. But as the saying goes, the traveller must travel and his writing must follow. Anyways, I didn’t spend nearly as much time in Liberia as I had hoped or planned. I ended up in Liberia in the heart of the rainy season and most of the roads were impassable making certain destinations like Sapo National Park and Harper which I really wanted to visit inaccessible to me. My time in Liberia ended up being a complete anomaly from the rest of West Africa. I stayed put in a fancy hotel with good internet for about a week before moving on. 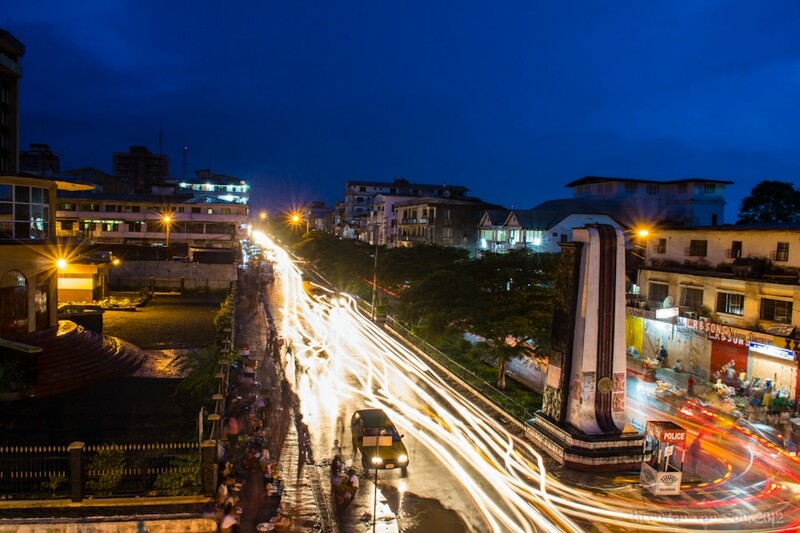 I took this week’s photo from my perch above the main street in Monrovia at a great hotel called The Palm Hotel. I love this image because I feel like it shows the chaos of West African streets. Most photos I’ve taken of roads at night provide perfectly straight light trails as cars drive in a direct line. These light trails zigzag all over the place as cars go, well, wherever they fit. If you don’t know how I got this shot than you have some reading to do. One of the books that I both love and hate is Scott Kelby’s Digital Photography book. I love it because it is a simple approach that basically explains how to do certain things with a digital camera. Basically, if you want to learn how to make light trails from cars, or turn the street lights into stars it goes over it in a really simple manner. I hate the book because as great as Scott Kelby is at explaining things in simple terms, his humour and writing style causes me to cringe at least once a page. Regardless, if you look past his attempts at humour, you’ll get a lot out of that book and the others in his series. To put things simply, this was shot at a long exposure (30 seconds) and a narrow aperture (f/11) during the photography “blue hour”. On another note, I am in the process of writing another photography book myself it should be ready in a month… I promise it will be humour free. Love this shot–very creative and has great composition. Like the colors, too! Thanks Lisa – I had a great perch to shoot from there in Monrovia. Nice long exposure shot, Brendan. I was actually wondering if you would be writing a photography book at some point. I’d love to check it out when you’re done. Thanks Dean, the way I ‘m so far behind on things right now the book might be a couple months away at least! What a great article. It touched my heart because I lived in Monrovia from 1970-1975. The friendships and memories of that time in my life are very dear to my heart. MANY of us are still in regular contact – even if most of it is via Facebook! Several friends have gone back to Liberia to do great things – establish schools, libraries, wells for drinking water, and teaching women to be self sufficient. Liberians are wonderful people who have suffered greatly. I’m ecstatic you had a great experience and wrote from your heart! Too many other writers have only concentrated on the past. I would imagine your mother is very proud of you – I am 🙂 Thank you!